Teal Rocks!! The Allergy Table Launches Food Allergy Awareness Campaign! Home » Press/Events » Teal Rocks!! The Allergy Table Launches Food Allergy Awareness Campaign! Allergy Table launches Food Allergy Awareness Campaign for Halloween. It comes every year like clockwork. 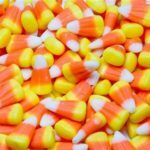 Every 365 days we encounter that dreaded holiday that revolves exclusively around candy and food. As if sugary treats weren’t enough someone went and threw in the addition of character costumes, staying up late and romping around through the neighborhood on a quest for the houses passing out full size candy bars rather than pennies. So what is it were talking about? You guessed it; Halloween! If you ask a kid what holiday is their favorite, 9 times out of 10 the answer will be Halloween. Why? Well…. It’s a kids dream day and a food allergy parent’s worst nightmare. Any parent of a kid with severe food allergies knows what I’m talking about here. 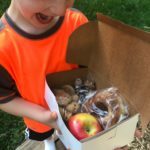 That magical day for our kiddos is a day of fear, anxiety and caution for us food allergy mommas! As parents we have an instinct to protect our kids from harm…and for food allergy parents that harm becomes food. It’s everywhere….literally everywhere! It’s the center of school classroom Halloween parties. Room moms stalk Pinterst in hopes of finding the coolest most spookiest and creative Halloween treats out there. And then of course….. the grand finale of the day is running from house to house filling up a candy bucket (or pillowcase if you’re from my generation) with a bottomless supply of sugary bliss! So what do we do as FA parents? Well, if you’re like me you walk closely behind your kid(or run to keep up if their 8 like mine) armed with your Epi-Pen bag of life saving meds praying they don’t touch anything in their bags until you get your hands on it all to weed out the unsafe stuff. Those dreaded NUTS are everywhere! Ugh! Peanut M &M’s and Peanut butter cups are in full prevalence for sure and every once in a while a homemade treat gets thrown into the bag which is even worse because seriously who knows what those are made out of. As we trick or treat I see most parents strolling along drinking a well concealed adult beverage and laughing with their other adult friends like there is not a care in the world. Not Me! Nope! I am on high alert…..The. Whole. Night. It makes me seem crazy to others I’m sure, but screw it…. ; what’s worse seeming crazy or keeping my kid from dying? You know what’s one truly awesome thing about Halloween? The Teal Pumpkin Project! In honor of food allergies you place a TEAL colored pumpkin on your porch which means you have nonfood items to pass out to anyone with food allergies. I wish I could hug the person that came up with this idea. Seriously…. This is like a breath of fresh air for me every time I spot a teal pumpkin at a house during Trick or Treating! I can actually relax for a moment, breath, laugh with a friend, and pretend that I am just a normal mom walking along enjoying a night of trick or treating with my kid. If you’re reading this and are one of those people who participate in The Teal Pumpkin Project I just want to say thank you a million times over! Thank you for your support, thank you for your empathy, and thank you for caring enough to make my food allergy Kids night a little safer. If you don’t participate or have never heard of it, no worries you still have time to join the Project. All the good deeds you’ve told yourself you would do that got missed along the way can be checked off with this simple act of kindness. Think of all the kids your helping to keep safe and feel included. 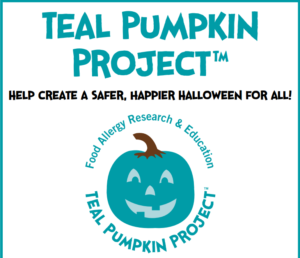 Unfortunately many people out there have never heard of this Teal Pumpkin Project thingy…and simply can’t participate because they aren’t aware of it. This is why The Allergy Table is launching THE TEAL ROCKS CAMPAIGN this year. Stop by our booth at the Rochester Farmer’s Market on Saturday between 8-1 and grab a painted Teal Rock from us. You simply take the rock with you, leave it in a public place for another to find and that is it! The person that finds the Teal Rock will see The Teal Pumpkin Project Logo on it and wonder what it’s all about. They may look it up, ask a friend, or slip in in their coat pocket to pull out and wonder about later. Whatever they end up doing, it promotes awareness; whether its a conversation started, a question asked or a seed planted for later. These Rocks are meant to spread awareness and open up conversations with people about Food Allergies and The Teal Pumpkin Project. If you’re not local to us….no worries! Just grab some teal paint and make an activity out of it with the kiddos. You can grab a sharpie marker and write over the painted rock THE TEAL PUMPKIN PROJECT! Your kids will love painting them and hiding them around your neighborhood! Some great places to leave these rocks would be public parks, playgrounds, a park bench, your public library, or even on the ground just outside your grocery store. Most all remember this….. Food Allergies are Real and millions of people suffer with them every day especially children! One simple act of Kindness involving a silly rock can save a child’s life. Think about that for a moment. Think of the good you are doing by participating in The Teal Rocks Campaign. So Stop by our booth this Saturday at The Rochester Farmer’s Market between 8-1 and grab a Teal Rock from us. It’s that simple. It costs nothing and …. It saves Lives!